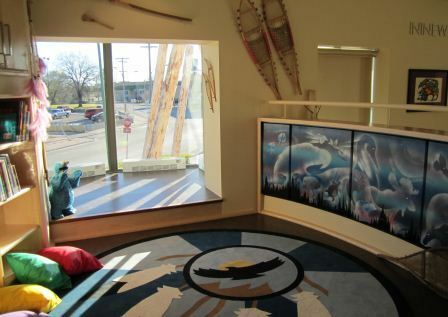 People's Library | Manitoba Indigenous Cultural Education Centre Inc. The collection includes over 11,000 books, periodicals, vertical files, music, DVDs, and educational kits. Subject areas cover all aspects of Indigenous cultures, both historical and contemporary. We have an extensive biography section as well as an excellent selection of poetry and fictional writing. The collection also includes juvenile fiction and non-fiction. Our Children's Reading Area has many wonderful books for the young reader. Children love the soft furnishings and unique domed ceiling depicting a starry night. The People's Library is constantly expanding it's collection. As a non-profit, charitable organization we may not always have the capacity to acquire new items for the library. If you are interested in donating to our centre, consult our Amazon Wishlist to see items we are actively seeking out. If you can't find a specific book in our library and you think that we should have it, please contact us. We're always adding items to our wish list and we would love to hear from our patrons about new books.